With equity indexes continuing to push powerfully higher, the VIX remained in cooling mode, settling lower for the fifth consecutive day, -6.7% @ 19.54. With the loss of the 20 threshold, the mid/low teens are now due. *the lowest VIX daily close since Aug'20th. Little to add. VIX is now back in the teens... it is not expecting too much to expect to see the 16/14s within 1-2 weeks. 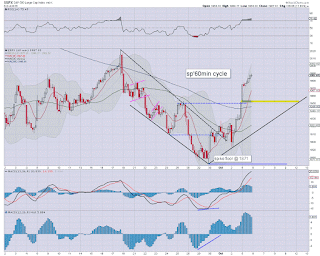 US equity indexes settled powerfully higher, sp +35pts @ 1987. The two leaders - Trans/R2K, settled higher by 2.3% and 2.4% respectively. Near term outlook is for continued broad upside.. beyond the 50dma of 2000, the 2020 high, and to the 2040/60 zone.. where critical resistance lays. .. and the week begins with a day of gains that give full clarity that last Friday was not just a bizarre sporadic day of upside. 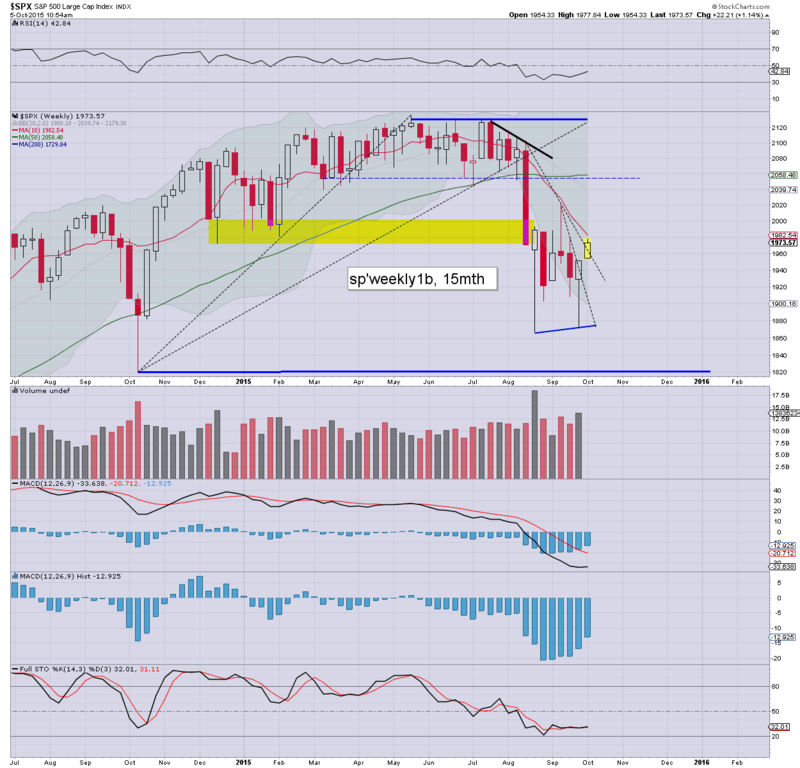 There is clearly going to be threat of a retrace in the immediate term... back to the gap in the sp'1950s... but I'd consider it an overly risky trade (unless you want a stop at 1990/2000). 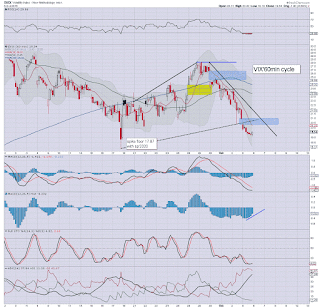 Broadly.. market looks headed for the 2040/60 zone by end month. 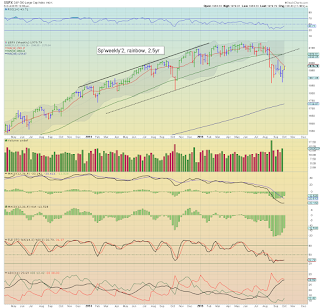 The absolute core issue now is whether sp'1860/71 was a key washout.. or just an initial wave lower. We should know soon enough. US equities are set to close with rather powerful net gains, confirming the hyper-spike Friday turnaround. Regardless of any micro down waves this week... the market looks headed beyond the recent 2020 peak... and make an initial attempt to re-take the daily 200ma.. and the monthly 10MA. *VIX confirming the equity 'normal service resumes' situation. Last week I gave the market all the time needed to break lower.. but with sustained action >1950.. the short term outlook is clear. As I said to someone today.. 'it is.. what it is'. yours... sidelines. At least on another overnight gap higher.. I can't lose any more. 2pm update - not exactly bearish.. is it? US equities continue to claw higher, with a new cycle high of sp'1982, which is 89pts (4.4%) above the Friday morning low. VIX continues to melt lower, with a new low of 19.29. 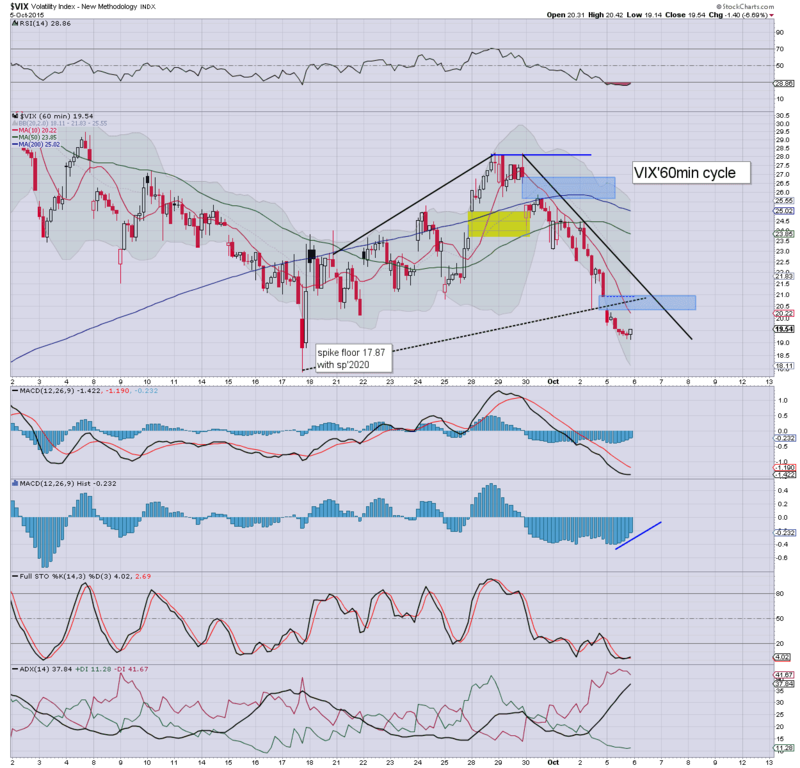 First target is the 50dma.. around sp'2000... after that.. its open air to critical resistance in the 2040/60 zone. Call it madness.. call it manipulation.. call it whatever you want.... for the moment, there is ZERO downside pressure, and those holding short are going to get ground to zero. Clearly, the smaller cycles are EXTREMELY overbought... but with price action as it is.. there seems little point in even pro day traders trying to capture a down cycle/retrace. Yours truly is more than content to stand OUT of the way of this... at least for a while. notable strength: NFLX +4.4% in the $110s. With no real resistance until the psy' level of 2000 - where the 50dma and upper bollinger lurk, the sp'500 continues to climb... +28pts @ 1979. This makes for a rather insane 86pts (4.3%), across just ten trading hours. 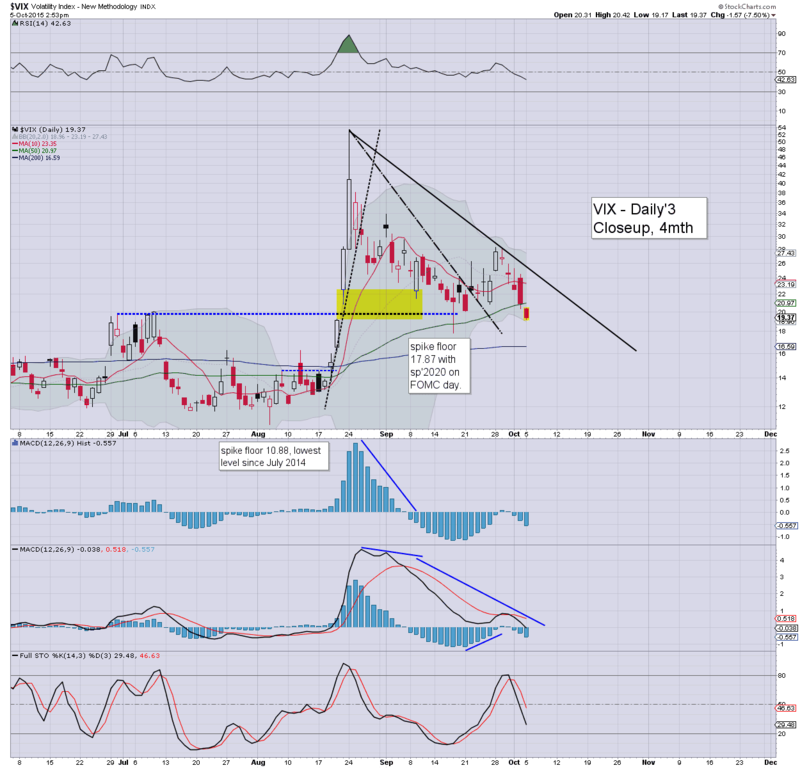 VIX continues to cool, -7% in the 19.30s. 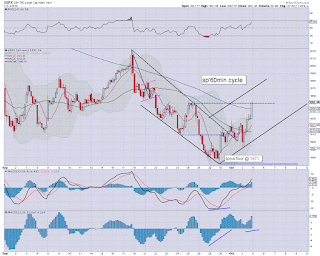 *it is notable that we're approaching key 10MA resistance on the weekly cycle.... awaiting a green candle. I do NOT expect the 10MA to hold in the current up wave from sp'1871. 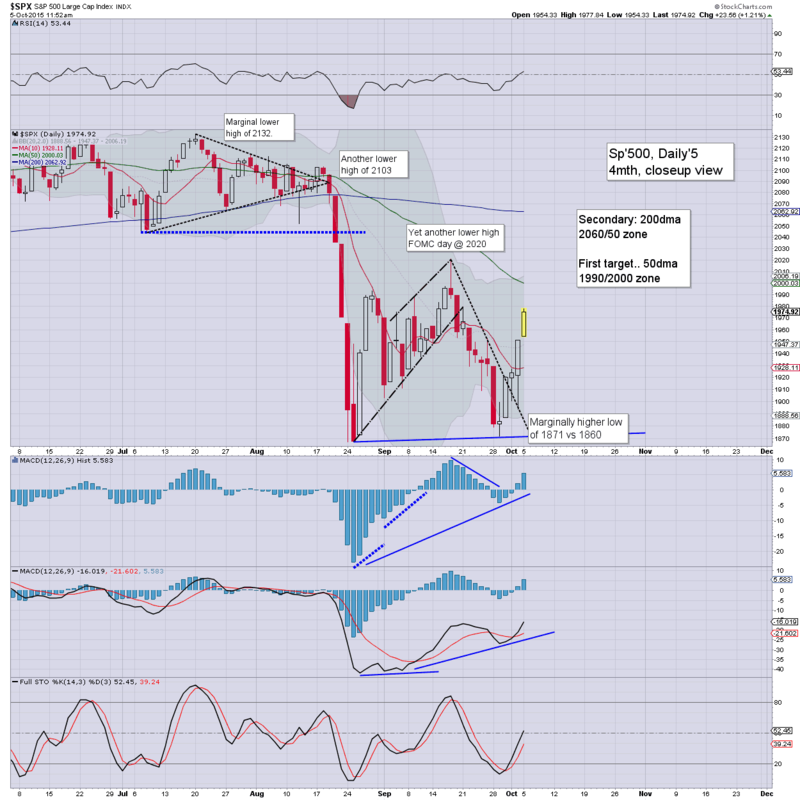 I would imagine the chatter this evening will be for some to consider a short from sp'2000 or so. I suppose that would offer moderate downside.. but really... I would not feel comfortable until 2050/60. .. with earnings on the way... can Mr Market rally broadly through it? With the main equity indexes holding sig' gains, the VIX is naturally melting lower, losing the key 20 threshold... and seemingly on a course for the mid/low teens by end month. For now, Mr Market is making a serious play to resume 'normal service'... on an attempt to break back over old (broken) supports. 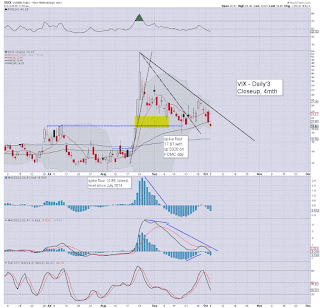 VIX is naturally subdued, and regardless of any little bounces this week, with the equity market set to at least test the sp'2000 threshold... the VIX is set to melt broadly lower. On the micro 5/15/60min cycles, all US equity indexes are clearly way overstretched, with the sp'500 having ramped 84pts (4.2%) across just 8 trading hours. 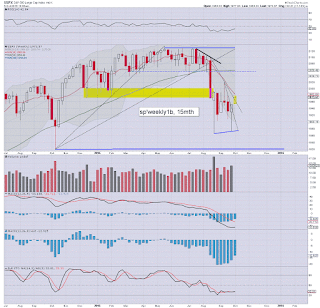 Equity bulls could sustain brief cooling to the 1950/40s.. and it would in no way negate last weeks powerfully bullish weekly candle. 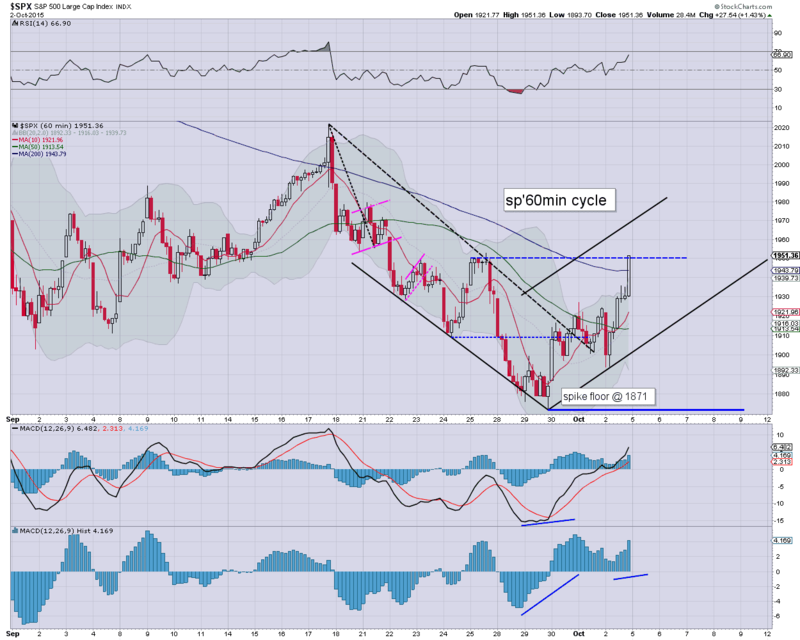 Seen on the bigger cycles, it should concern those resolutely holding short, that there really isn't any key resistance until the sp'2040/60 zone. Who wants to hold all the way to there? For the 3x leveraged ETFs, that'd equate to another 4%.. x3.. 12%.. plus.. add in some decay of say 3%... so.. thats 15% downside... probable. For short dated option puts... they'd effectively be zeroed out. I could reel off a list of a few dozen key stocks that are all showing hyper-bullish candles to start a new week. Suffice to say.. bears failed to contain the latest bounce.. and we're headed seemingly much higher across earnings season. *for the moment.. and probably the rest of this week, I have little interest in getting involved... not least on the short-side. The next decent short-side trade doesn't look viable until at least 2000... and I'd really not be comfortable unless 2050/60... with the latter being some weeks away. *with sustained action >sp'1950, I've cleared the decks, closed out 3 short-market positions. There seems ZERO point in holding short from here. Call it capitulation, call it weak... call it whatever you want.. but that is my level where I ain't fighting. I have already seen a number of people tout the next FOMC minutes as the start of the collapse wave.. but really.. why? The bigger weekly cycle put in a spike floor last week.. and that sure ain't bearish. 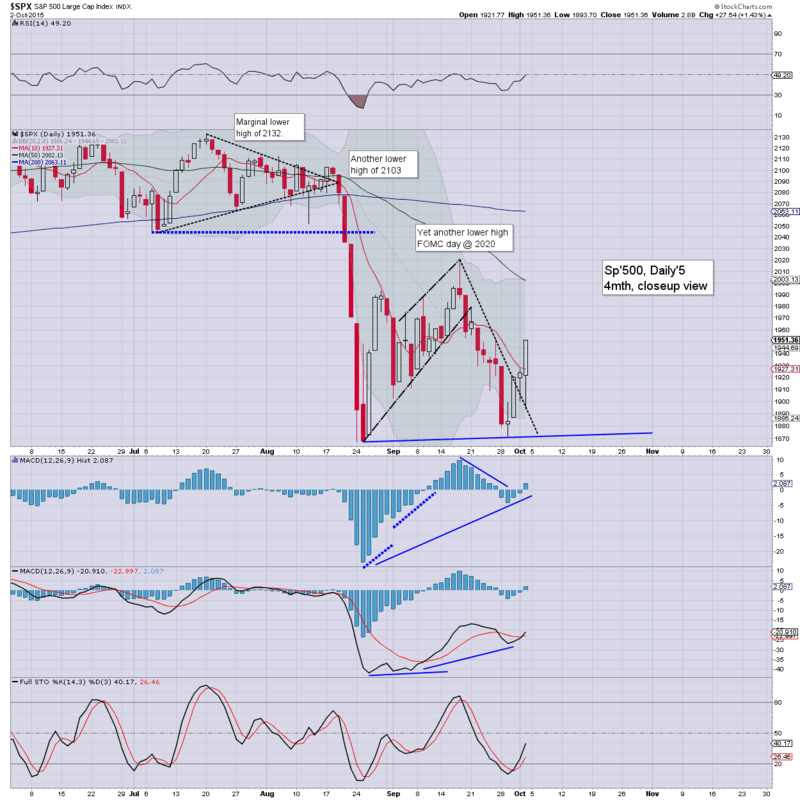 We look headed.. at minimum to sp'2000... but almost equally viable... the 200dma in the 2060/50s. Would you want to go long from here? Or re-short... even though there is INCREASING upside momentum? Frankly, I see it as overly risky on both sides... unless you are a super flexible day-trader. Good morning. US equity futures are moderately higher, sp +11pts, we're set to open at 1962. USD is cooling, -0.2% in the DXY 95.60s. Commodities are mixed, Gold -$4, whilst Oil is +0.6% in the $46s. 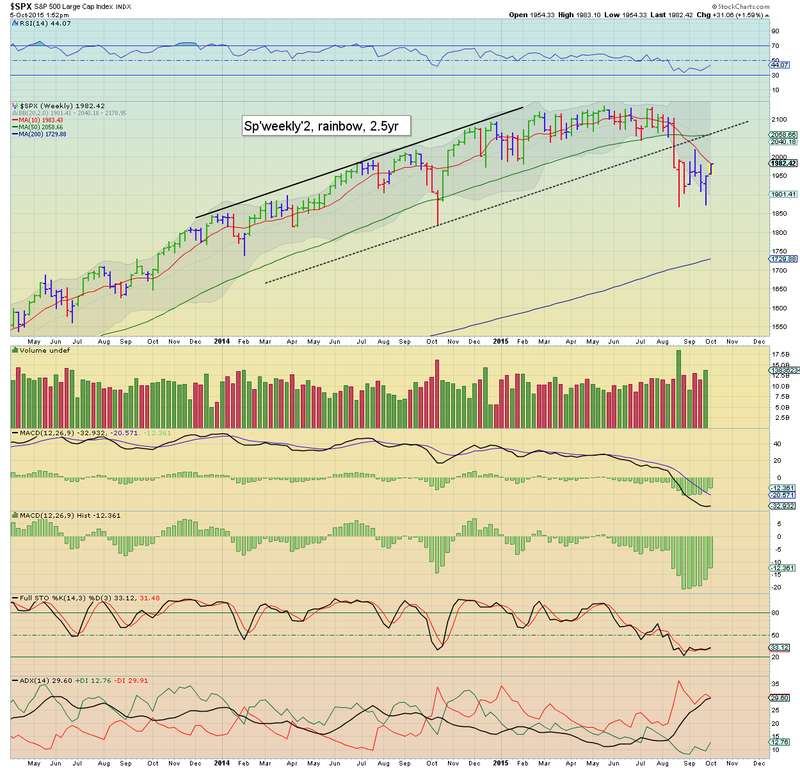 Clearly, the market is set to see follow through from last Friday's hyper-turn around. Despite the micro cycles being extremely overbought, we'll likely be in the 1960/70s this morning... and the big 2000 threshold will be within range. 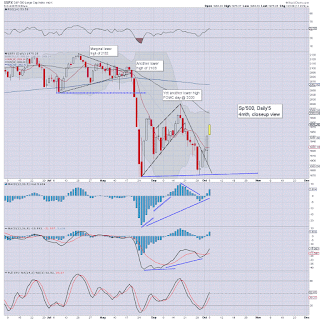 Yours truly is set to wave the white flag at the open, and drop 3 short-market positions. There is next to zero point in holding any longer, whilst the market looks like it wants to rally across earnings season. As for taking another trade.. it would seem ludicrous to go long at these levels, but then, a re-short seems equally risky.. whilst the daily/weekly cycles are pushing back upward. So... I'll likely 'clear the decks' at the open... and then sit it out for some time. There is an awful lot of crazy talk in this discussion (much of which I don't agree with)... make of it.. what you will. Japan, jumped higher at the open... settling +1.6% @ 18005. No doubt the BoJ are out there... meddling. 8.29am... watching the Bernanke on clown finance TV.... I'm no fan of him, but you gotta admire his tolerance for those cheerleaders this morning. Q. How much is he getting paid? The usual 250k per hour... or even more? Hell, its almost as good as working at the fed where you can could (in theory) just print your own salary at the end of each month! Naturally, ZH are going hysterical that Gartman has now turned bullish. Yet... ZH seem lost in the minor noise.. utterly unable to discern much of anything from anyone. I'd dare say Gartman is still 'broadly bearish'.. but with a short term upward view.... as am I. Of course.. in the world of ZH, every day is the end of the world. If you disagree with that sentiment.. .you're at the wrong blog. 9.34am.. OUT. Exited remaining 3 short-market positions. Lousy situation, but not holding on sustained action >sp'1950.